Nio Dragon Festival' is hold to pray for rain in Mitoyo city, Kagawa Prefecture. 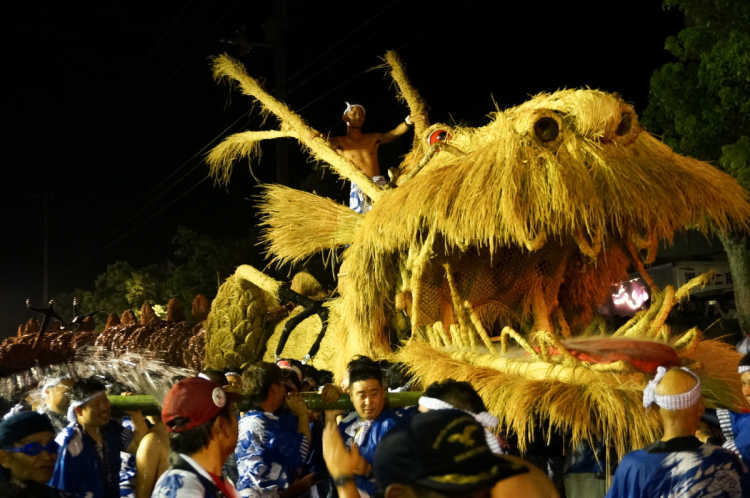 A huge dragon made of straw and bamboo , which is as ling as 35m and weights 2t, is carried by 200 people. Then, the other people with buckets and water guns throw water from the both sides of the street. It's an exciting summer festival.◎Date & Time: 8/5, water throwing is 20:00~. You need to wear you can get wet and bring buckets, water guns and so on. There're some food strolls.